What can grow to be 7 inches long, lay up to 200,000 eggs per day, and live in your pet’s intestines? That would be a roundworm. And if all of that doesn’t sound gross enough, consider the roundworm’s means of survival: it gluts on partially digested food as it passes through a dog’s gastrointestinal tract. Roundworms earned their name because of their tubular, or “round,” shape. There a couple of different species that can affect your pup, but the most important to know are Toxicaris canis and Toxicaris leonina. Dogs (and cats) can get roundworms from a variety of carriers. The most common source is other dogs; because infected dogs shed microscopic roundworm eggs in their feces, your dog could become infected by getting too close to another dog’s poop. He or she doesn’t even have to eat it – a simple sniff or lick is all that’s needed. Roundworms can also be spread by other animals such as rodents, earthworms, cockroaches, and birds. Once roundwormeggs are ingested, they undergo a complicated life cycle before establishing themselves in the dog’s intestinal tract. In fact, as they mature from larvae to adult, roundworms are capable of migrating through various bodily tissues. This is important: in a pregnant female dog, this means that unborn puppies can be infected rather easily. Puppies can then be born already infected with roundworms. In addition, roundworm larvae may also enter a mother dog’s mammary glands and be transmitted through milk. Roundworms are never good, but they are most threatening to puppies because they can stunt their growth. Think about it: roundworms are hanging out in a puppy’s intestines, devouring a large portion of partially digested food before the puppy’s body can absorb it. This can deprive a puppy of vital nutrients it needs to grow and develop into a healthy dog. Also, roundworm infection frequently leads to severe diarrhea, further exacerbating loss of essential nutrients and calories. To determine a diagnosis of roundworms in your dog, your veterinarian will perform a microscopic examination of your dog’s feces. 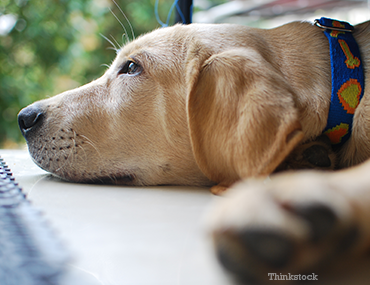 Infected adult dogs can be affected similarly, but are at less of a risk than puppies. This is because puppies have less developed immune systems, meaning that roundworms are able to more easily mature in their digestive tract. In adult dogs, by contrast, few roundworms will mature in the bowel of infected adult dogs. This is important: because few eggs are passed into the stool of an adult dog, diagnosis may be difficult. Other species of roundworm, though less dangerous, can complete their life cycles in any age of dog (or cat) and are a bit easier to detect. Treatment is simple and effective. Most likely, your veterinarian will administer a broad-spectrum de-wormer medication and will establish a regular de-worming protocol and monthly preventive program. Roundworms aren’t just a danger to your dog. They can actually be transmitted to humans. If a human is unfortunate enough to ingest a large amount of roundworm eggs, infection is possible and may result in serious disease. This is especially true in very young children (before they are walking) or any individual with a compromised immune system. Because of this, it is extremely important consult your veterinarian if you suspect your dog has roundworms. The Center for Disease Control recommends that pet owners take steps to keep your pet free from roundworm infection. Your veterinarian will likely recommend a monthly heartworm preventative that is also highly effective against roundworms and other parasites such as hookworms and whipworms. Additional steps can be taken to prevent roundworms, including rodent and pest control. To keep children safe, encourage hygienic practices such as hand washing, cleaning up after your dog, steer them away from dog feces, and keep your dog from defecating in or around children’s play area.